Check out this cool blog post at Humble Dwelling, sharing a neat idea on rewarding kids for cleaning up and helping with house chores. The Happy Saints printable badges were made into coins the kids can earn by doing house chores, and exchange for cool rewards in the ‘family store’. Thanks for talking about my chore/reward system! I made these coins long ago and we still use them every day. 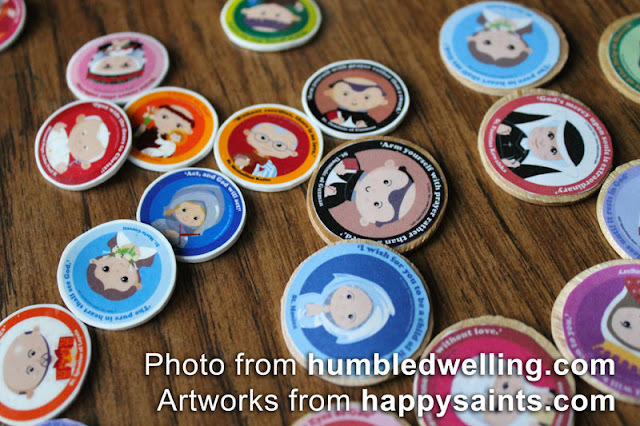 :) I'm now working on a Happy Saints feast day calendar, but at the rate I'm going, I really hope I finish before next January!